Edge Desserts: Cherry Pie or Not Cherry Pie? Cherry Pie... or is it? Oh man, I thought this pie was the "bees knees"... practically licked my plate I did! It was absolutely the most I had ever enjoyed a slice of cherry pie in my life! 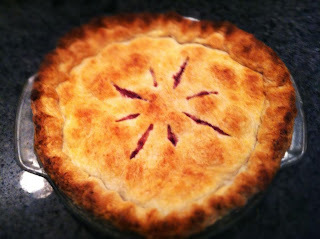 I really like cherry pie, so I'd be a good future critic (hint, hint).